The island is so small that cartographers can't even put it on their maps (not enough resolution). 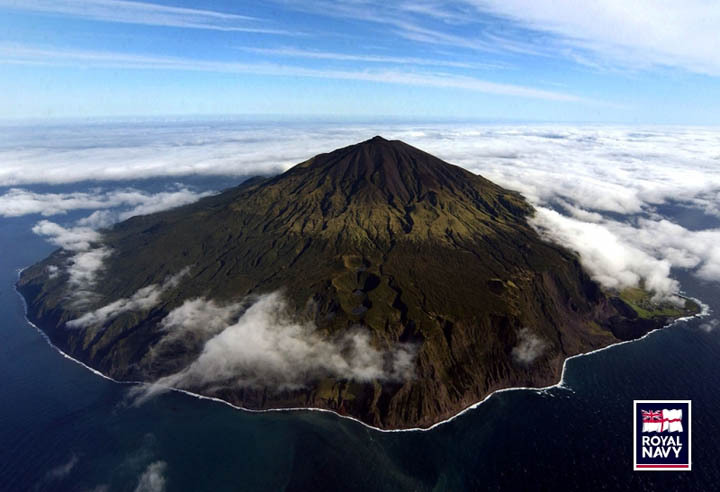 Located in the South Atlantic between Africa and South America, this volcanic outcropping has the honor of being the remotest inhabited island on the planet, and that's including Antarctica and the North Pole. 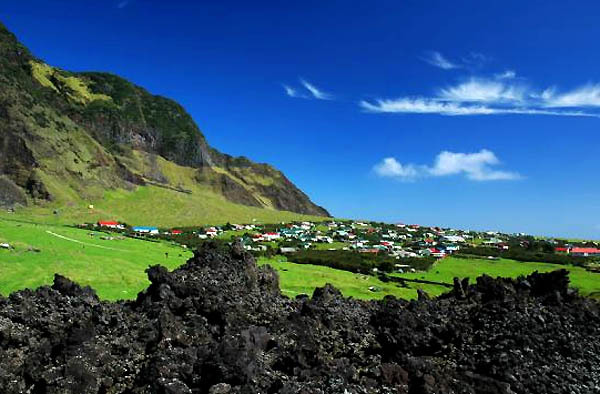 One of the islands in the archipelago is called "Inaccessible", which only seems appropriate, together with their motto: "Our faith is our strength"
Language: English, Population - barely 300 people. 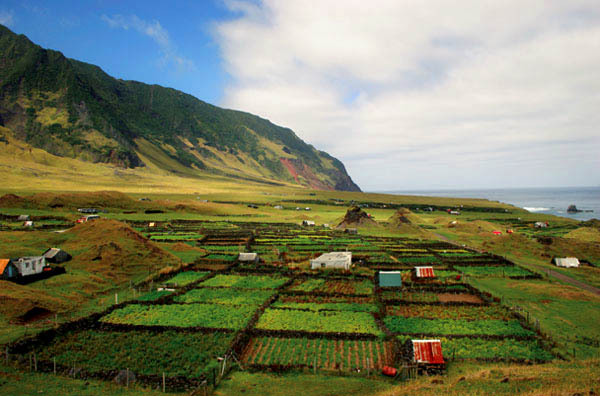 Tristan Da Cunha is home to a population of 270 very isolated people, with an economy based in the fishing industry. 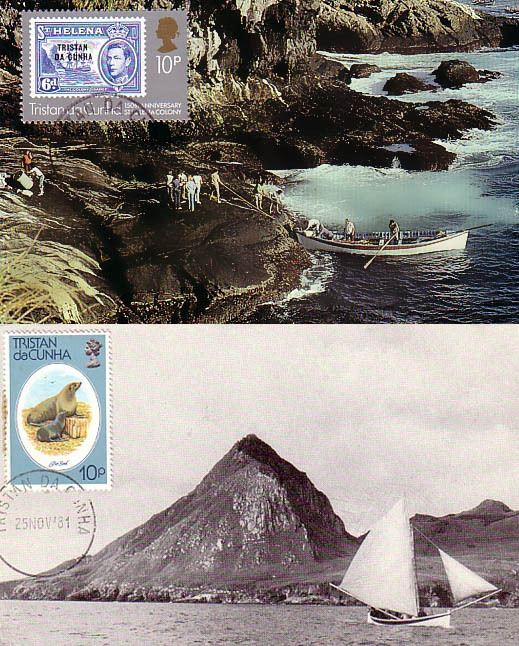 The climate is sub-tropical, with very little variation in temperature from season to season, and it would probably be a pleasant place to stay... if there were more arable land: the only sort-of level bit of land is located at the northwestern edge of the island, and the rest is moutainous and rocky. 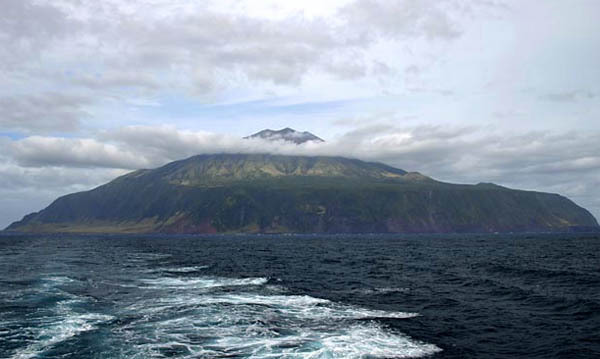 The group of islands is a huge volcanic formations which rose out of the South Atlantic about a million years ago. 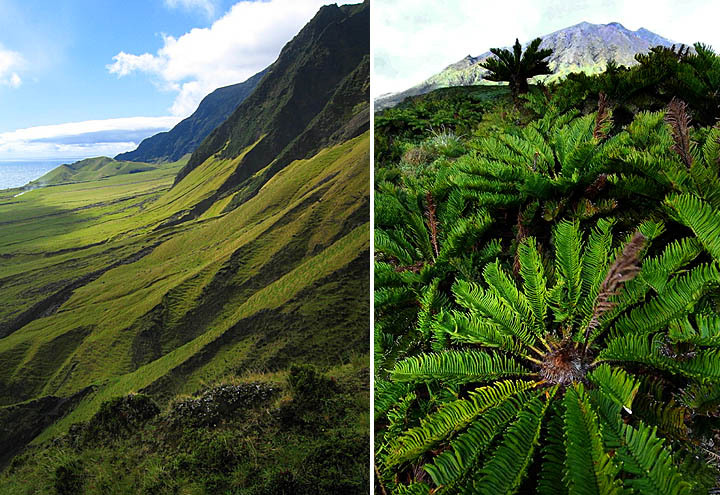 They are located on the edge of the caldera of the very active volcano! In 1961 a cone near the town, Edinburgh of the Seven Seas, began to erupt and the whole community was evacuated to England. After 2 years, an investigation was conducted and it was found that damage was minimal and the residents were allowed to return. Islands of Refreshment, this is how self-proclaimed ruler (remember our little "despot" joke in the beginning?) Jonathan Lambert called these islands in 1811. "Lambert declared himself sovereign and sole possessor of the island group", but he did not last long, as he drowned while fishing a year later. And here are the "refreshments" - Genuine Tristan Lobster Tails - the tastiest in the world! "Unemployment on Tristan is almost unknown, with both girls and boys guaranteed jobs when they leave school, even if posts have to be specially created for them. In recent times, girls have increasing started to continue their education (usually at St. Helena) - young women are increasingly becoming an intellectual elite on the island." 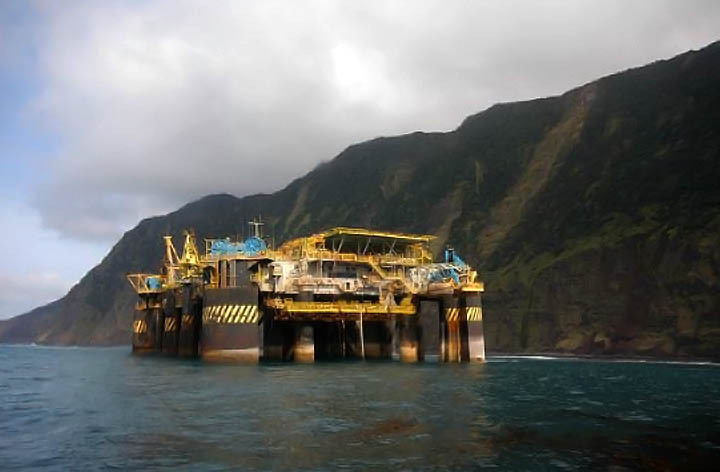 - the whole abandoned and grounded oil rig! For the list of other remotest uninhabited places, visit this page. Right about now a remote tropical island looks pretty good to me. I enjoyed this post. You can see it on Google satellite maps, very high resolution actually. is the island of LOST!!! Absolutely fascinating! I want to go there, as I'm sure many others do too. It's best we don't though as it'd get ruined pretty quickly. I'm glad there are sites like this to learn from. Back before Mac OS X, the Macintosh operating system had a Map control panel. 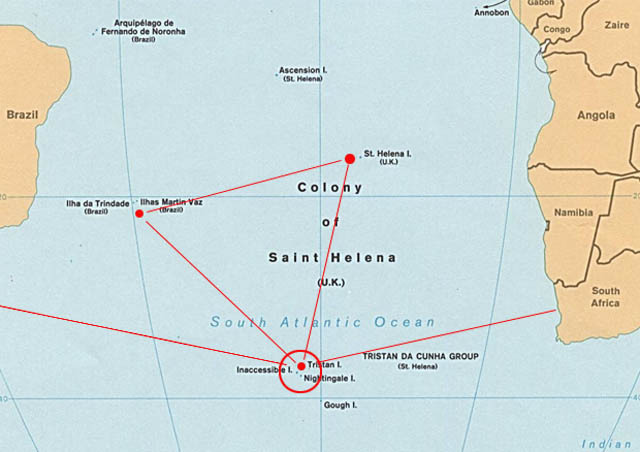 If you typed "Middle of nowhere" in the text box and hit Enter, the map cursor would land on Tristan da Cunha. It's a paradise.. I would love to visit the island. Hope I can do it one day..
How about the Easter Island? I am from St Helena! Everyone should see this place! This is, in fact, a fantastic world!...The island was first sighted in 1506 by a Portuguese sailor, Tristão da Cunha, but he didn´t land due to high clifs all arround the island. I just can imagine what these explorers, such as Livingstone and Magellan (Magalhães), may wonder when they discover places like this. Imagine you start hearing some distant but intense noise in middle of inexplored jungle in Central Africa and finally get a first sight of the Victoria Falls... Feel so envy! I looked on Google Earth, but couldn't find the oil rig. Those islands look like my kind of place, wonder if they have a radio station! They DO have a radio station! Wonder if they need a broadcast engineer!?!? Abandoned oil rig; nice! The responsible company who abandoned it should dismantle it. Yeah, let's to that to the Artic refuge in Alaska! Why are there no trees? It isn't that far south. This is not the remotest place on earth. Go to Google Earth and find this island. Now pan back. You'll notice a little green baloon a bit down and to the right. dammit, someone beat me to the punch. i was going to say "craphole island!". If I'm ever featured on America's Most Wanted, this is the place I would run to! Looks like a cool place to visit, but how long and where would you stay? I didn't read anything about an airport, and even the South Pole gets mail more often than once a year. I wonder how the diving is? 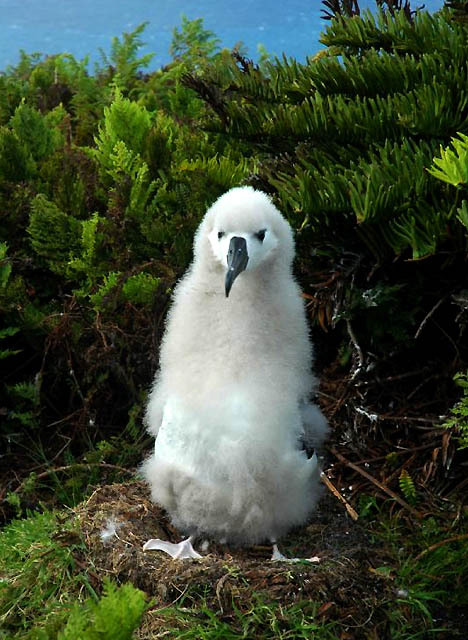 Tristan da Cunha is not the most remote island in the world! Bouvet is! 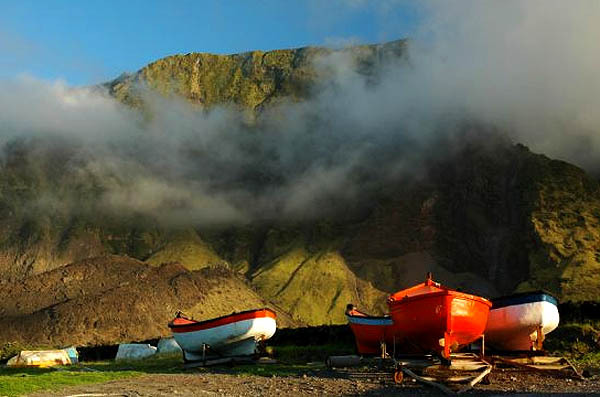 Tristan da Cunha is the most remote archipelago in the world. I'd love to go urban exploring on that oil rig. That oil rig demands its own post.... let us know if you'd get more pictures! Great post, I wish there were more pictures and meet some people from the island. How much would a boat trip be and how long would it take? Thanks again. I thought that that oil rig would be the coolest place in the world to live. Then I found this. Oh Noes! Oh well... Nothing lasts forever. Looks like an amazing place to visit, but I couldn’t handle it for more than a couple of weeks, unless there were lots of beautiful virgins. I have been here! I was sailing across the Atlantic and stopped here for about six hours. It is a fascinating place, I have never seen anything like it. the people are incredibly friendly, and their homes can become a restaurant or a doctor's office whenever the need arises! I visited the school and the kids love to play soccer. We were careful to not buy out the tiny supermarket when we were there-only one chocolate bar per person! the surrounding landscape is also quite beautiful. Very remote, and a long lasting memory! Right about now I would love to send my wife there, on a one way ticket.lol. Seriously, what an amazing place. Amazing! it kinda makes me want to visit. Simply to see how it must feel to be sooo remote. and a hell of a site, congrats! I'm from a place not as remote but once shrouded in as much mystery. We have been transformed over the years from a small piece of "escape to paradise" to a busy, bustling, almost completely urban and modern comopolitan destination. The current generation thinks they are living the life. (But)It's a shame for the next generation and a heartbreak for the last one. Great photos... How do you get there? What a beautiful place. 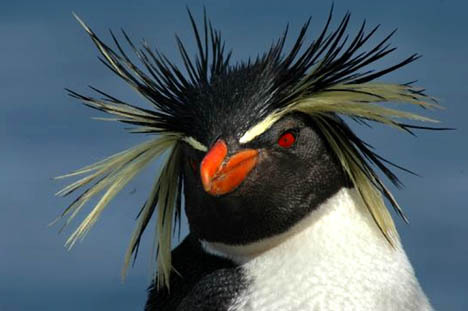 And for the rock-hopper penguin - Nice hair! Oil rig was disposed of in February 2007. This island is a drain on the British economy. It should be decolonised like other former British possessions. Sovereignty could be transferred to Brazil and it could become a Special Adminstrative Island of Brazil i.e. it could have Home Rule with Brazil only in charge of defence and foreign relations. The islanders could keep their British passports or take up Brazilian passports. The islanders could be given free college and university education in Brazil (and free transport annually) as part of the tranfer of sovereignty deal.